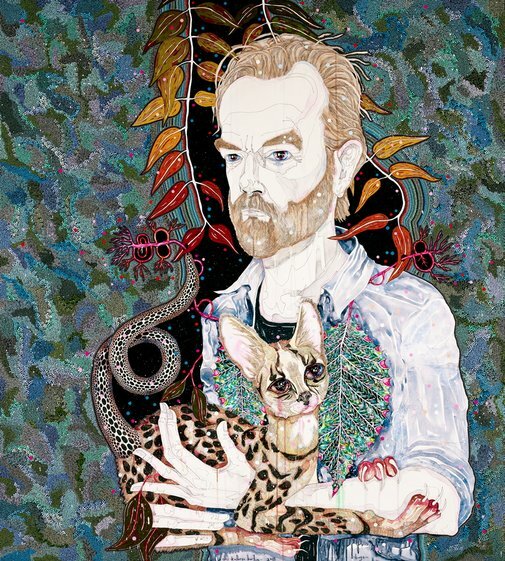 One of Australia’s most acclaimed actors, Hugo Weaving’s multitudinous credits range from blockbuster films like The matrix and The Lord of the Rings trilogies to smaller Australian films such as Oranges and sunshine ; from the television series Bodyline to over 20 plays for the Sydney Theatre Company including Les liaisons dangereuses , Hedda Gabler and Uncle Vanya . Barton’s decorative, highly detailed paintings are known for their vibrant, figurative imagery – combining traditional painting techniques with contemporary design and illustrative styles. This is her fourth time in the Archibald Prize, which she won in 2008 with a portrait of herself with her two children.